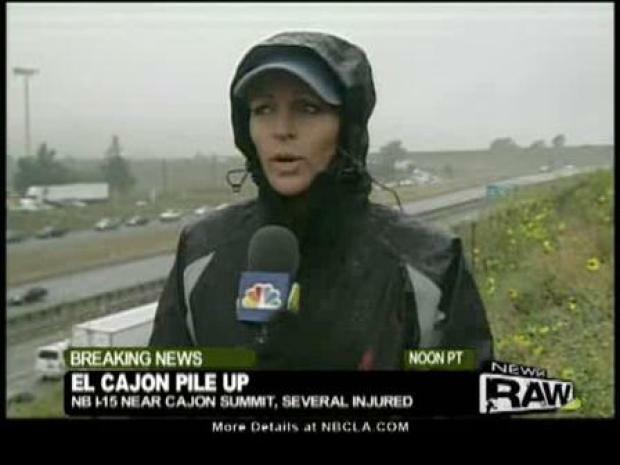 Traffic backs up on the 15 Freeway after a 50-vehicle pileup. 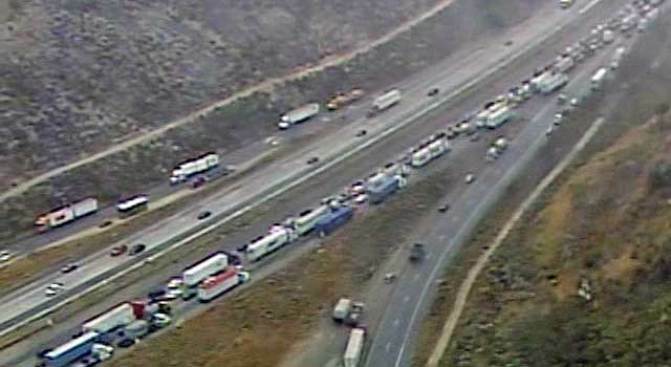 A chain-reaction crash closed the northbound 15 Freeway Wednesday morning in the Cajon Pass. The road is closed between the 215 and 138 freeways. It was expected to reopen at about 1 p.m.
A witness said a motorcycle was also involved. At least 15 injuries were reported. Ten of the injured were hospitalized and five others declined treatment after being interviewed by paramedics at the scene, said Tom Barnes, a San Bernardino County fire dispatch supervisor. He could not characterize the severity of the injuries but said only two of the patients required immediate transport. A chain-reaction crash involving 50 cars injures more than a dozen and shuts down the 15 freeway for hours. Conditions were too foggy for helicopters to fly, so the injured were transported by ambulance, he said. The chain-reaction collision began when two tractor-trailer rigs crashed in northbound lanes near Oak Hills Road, spawning more accidents, officers said. At least one diesel spill occurred. Cajon Pass rises to an elevation of more than 4,100 feet in the San Bernardino Mountains about 45 miles east of Los Angeles. It carries Interstate 15 traffic between Southern California cities, Mojave Desert cities and Las Vegas. A long jam of northbound traffic stalled at the bottom of the southern side of the pass, where I-15 connects with other major highways. The California Department of Transportation warned travelers to avoid the area if at all possible. Southern California has been enduring a siege of "June gloom" weather, a deep marine layer that pushes inland from the ocean, bringing low clouds, fog and drizzle.